IlyaM: GetStrongAtJoseki part 4 shows following variation in exercise 10. The accompanying text says that is a mistake and it is asked how to punish this move. As a solution the following sequence is given. 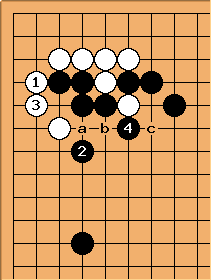 The book says that black's atsumi surpasses territory gained by white. 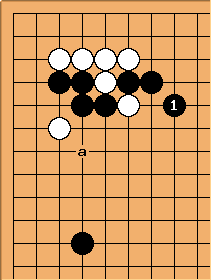 In exercise 15 shown similar position (i.e as response on cut black plays at instead of 'a'). The book says it is a mistake by black and asks for correct response by white. As a solution this sequence is shown. The books says that black's profit in the center doesn't compensate for territory gained by white. What I don't quite get is the difference between these two variations. To my view in both cases results are quite similar - white gains same territory, black gains atsumi. The only difference is that in one case black captures two white stones and in another case black captures only one. Is it all or am I missing something? 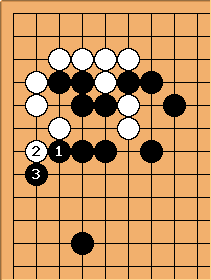 Why one variation is favorable for white and another for black? 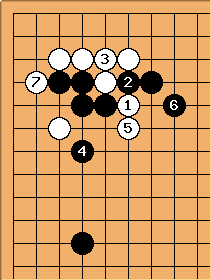 DJ: My 2k opinion is that in this variation Black has, however remote, bad aji at points a, b and c, which is not the case with the first sequence. So his thickness is not perfect and doesn't balance White's profit. Alex Weldon: I think it's more that in Exercise 10 Punishment reaches further into the center than in Exercise 15 and that B has captured two stones instead of one. Being one line further out towards the middle is worth a few "points" worth of influence. Furthermore, in Exercise 10 B himself has about 6 points of actual territory in his formation, whereas in 15, he can only count 2 points for the captured stone. I'd say Exercise 10 is at least 5 points better for B than Exercise 15 for these reasons. 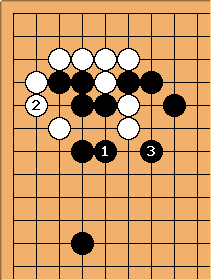 Bill: Also, Black's strength on the left side is different, as these two diagrams illustrate. 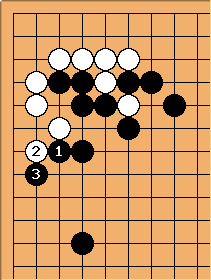 Black has significantly worse aji in the Thinner diagram.